Providing extraordinary pet care for people who care, by people who care, since 1981. Owned and operated by Bruce Gregory. Voted #1 By Customers in Verde Valley 6 times in a row! 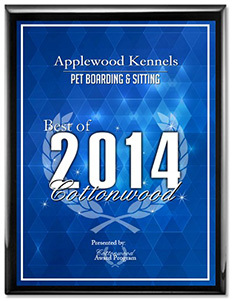 AppleWood Kennels is one of the most highly recommended boarding and grooming facilities in the Verde Valley. The Kennel’s proud owner, Bruce Gregory has owned and operated several award winning boarding facilities located in New York, New Jersey, Florida and now, Cottonwood Arizona. The newest addition, located in Cottonwood Arizona, is conveniently located off interstate 17 on Route 89A; a quick drive from many of scenic and historic sites located in the Sedona area. "Applewood Kennel & Grooming is the B E S T place for your pets! Cooper & Lola are always excited to go see everyone of the staff. Bruce & Adriana are the most pleasant couple. Their attention to detail is truely a gift. So glad I found them in Cottonwood."